Theta Digital showcases latest high performance AV components | What Hi-Fi? Californian manufacturer showcases latest high-performance AV components at the International Consumer Electronics Show (CES) 2014. Californian company Theta Digital has showcased its latest high-performance AV components at the International Consumer Electronics Show (CES) 2014. MORE: Stars of CES 2014 – the winners revealed! The new components include the Casablanca IV Music and Cinema Controller – the latest version of the company's preamplifier/processor. Advanced features of the new Casablanca model include a Dirac Live 96K digital room correction, a 192kHz post processing board and Theta's Jitter Jail II anti-jitter technology. Theta's first Class D amplifiers – the Prometheus Monoblock Amplifiers – are the result of a collaboration between the company's chief engineer Dave Reich and Bruno Putzeys of Hypex. The Compli Blu 3D Digital Transport (above) – optimised for digital playback and with no analogue outputs – and California Audio Technologies Custom Speaker system complete the line-up of new components. 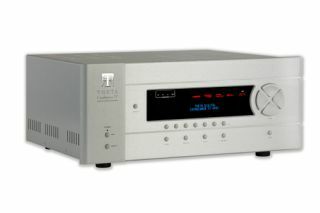 Theta's new range of high-performance AV components will be distributed in the UK by Absolute Sounds.